GOTTA STAMP WITH SUZANNE JOHNSON: MY MAGICAL PARTY PAGE FOR THIS WEEK'S MDS MONDAY BLOGSPOT CHALLENGE! MY MAGICAL PARTY PAGE FOR THIS WEEK'S MDS MONDAY BLOGSPOT CHALLENGE! 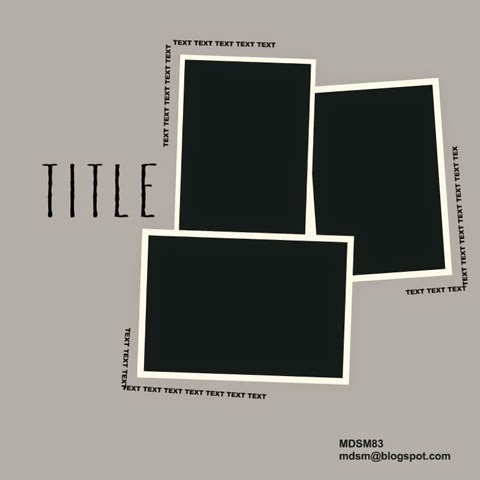 This week's MDS MONDAY BLOGSPOT CHALLENGE design took me a little longer to get just right. The challenge element was to use the tool that allows you to attach text to lines. As you can see in the sample, the lines are straight and follow the edges of the photo boxes. I played more with mine and used curvy lines overlayed on my photo and a line that started straight then went curvy for my title along the outer edge of a photo. I also used straight lines like the sample and laid those on top of my photo borders. 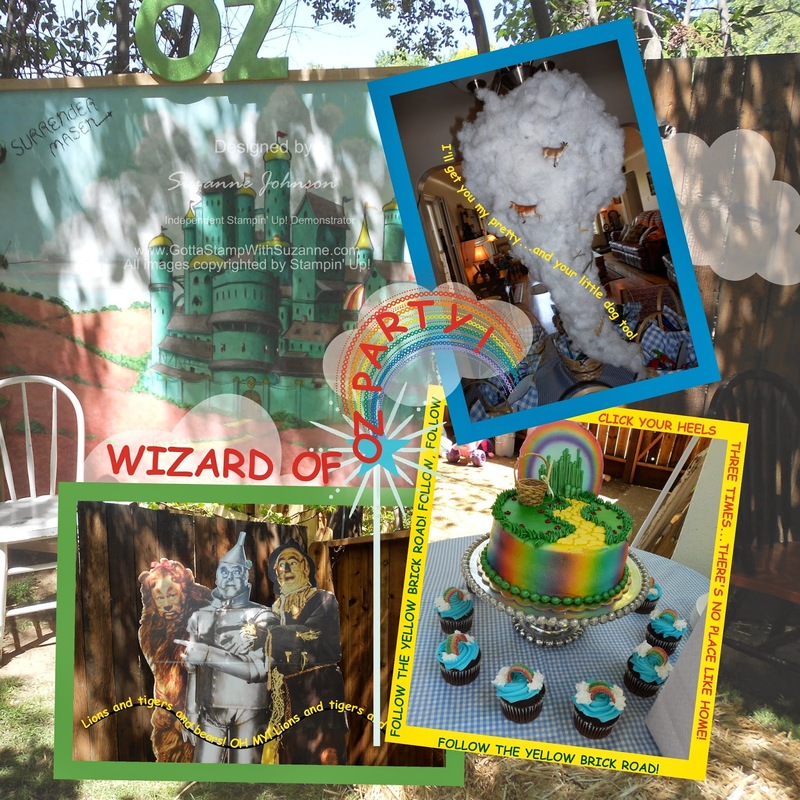 Here is my "Wizard of Oz" party page - last year I accompanied my cousin to this party her neighbors held for their daughter's birthday. The theme was carried out to perfection from the little gingham-lined basket favors to the apples hung from a tree in the backyard. I took lots of pictures! My background photo is of the painting they had on their back fence and the area they set up with hay bails and a chair for reading a story and opening gifts. The little girl was dressed as Dorothy - and could not have been more adorable, however, since I didn't have permission to use her photo I didn't include any of her in this project and just featured party and decor elements. I was so impressed with the tornado centerpiece crafted from chickenwire and poly stuffing, with little things like cows stuck in it just like the movie! I used Oz colors for my photo mats: blue for the Munchkins, yellow for the yellow brick road, and green for the Emerald City. I built the rainbow from a dotted circle stamp I cropped in half. For each color I made a copy of the half circle and reduced the size on each copy. I created the wand with a snowburst and a star stamps, and a freeform line. Getting the "Wizard of Oz party" title just right was a challenge. It is text attached to a freeform line, but I gave the line an angle and a curve. To a certain extent, that part was easy - but to get my line the right length and the angle and curve in the right places AND have the words follow the path I wanted took a number of detaching and reattaching the text so I could tweak my line, then try different font sizes, then different font colors! So, finally I have that done, but because of all the color variations in the background photo no color really stood out. One of the limitations of text attached to a line seems to be that the text has to be only one color (so no rainbow lettering). To make the text more distinct from the background, I put a semi-transparent pair of clouds behind, plus the rainbow. For balance, I added a third cloud off to the right where the background looked a little empty. Everything else is just photos with wide mats and variations of text attached to lines! Wow..that's a wonderful lookin' tornado! I really like how you curved your text too! Such a fun page! looks like a fun party! and a really fun page! FAST, FUN, FALL FOR FRIDAY! HAPPY HALLOWEEN HOME - NEW TUTORIAL! THIS WEEK'S MDS MONDAY BLOG CHALLENGE! MY CLUE FOR THE 2014 LNS TREASURE HUNT! I AM A GUEST DESIGNER ON MDS MONDAY!